Welcome to our homepage, please come in and stay for awhile. Go with us to the Korat pages to learn about our kitties and view some photos of them. GC,RW Kobalt Kalista of Mysticblue is 2nd Best of Breed National Winner for 2014-2015. She is Best of Breed Korat in Championship for Great Lakes Region, CFA, for show year 2013-2014 and for show year 2014-2015. 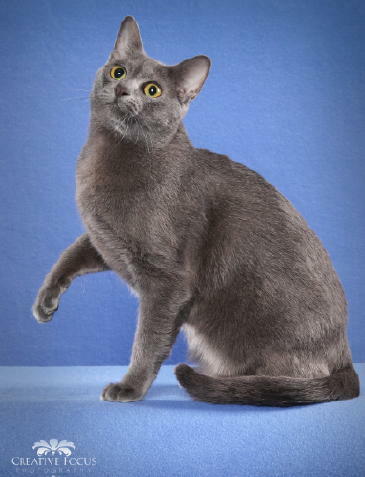 Kalista is 13th Best Cat in Championship in Great Lakes Region for show year 2014-2015 and Best of Breed Championship Korat at the World Show, Oaks, Philadelphia. Kalista is IC (International Champion) FIFe. 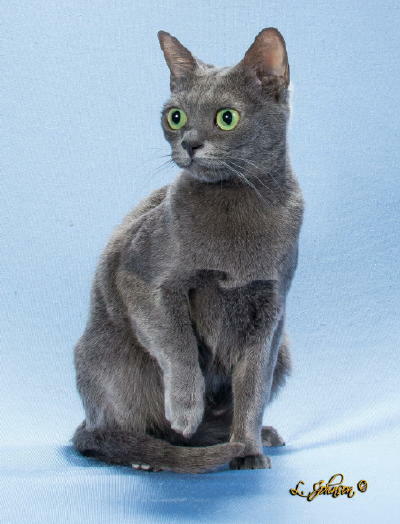 To enter our Korat page click on the picture of Kalista. Our handsome Korat boy RW QGCA Mistyblue Balki, The International Cat Association's Best Korat Alter for The show Year for 2011-2012 and Eighteenth Best Alter in the Mid Atlantic Region. He is Korat Best of Breed Premiership in Great Lakes Region, CFA, for show year 2013-2014 and 2014-2015. View additional pictures of our blue furry babies by clicking on the picture of Balki. Here is GH Dante, our beautiful domestic shorthair. Dante was 6th Best Household Pet in CFA Great Lakes Regon for the show year 2017-2018. His first CFA show was Greater Baltmore Cat Club Santa Paws Winter Festival on December 2 & 3 2017. 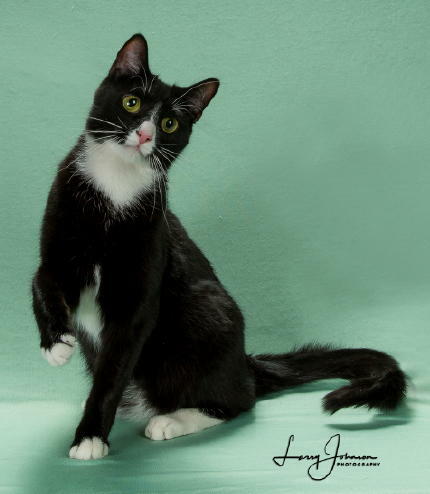 At four months of age, just a kitten, He enjoyed the show, loved playing with the judges' toys. At the conclusion of the show Dante received the prize for Baby Santa Paws. There were also Mama Santa Paws and Papa Santa Paws.